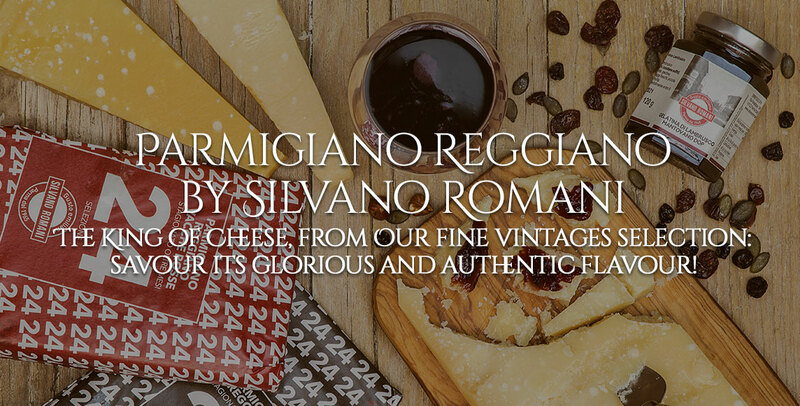 Lambrusco is a versatile wine, that is suitable for the most different combinations. Its sparkling and refreshing nature makes it perfect for summer happy hours, especially if it is served cool. Lambrusco is lately used in the preparation of cocktails, mixed with other alcoholic drinks and fruit. The most famous is “Spuma di Lambaroni”, happy hour based on Red Martini, Campari and orange juice, winner of Barman Day reward of 2010. 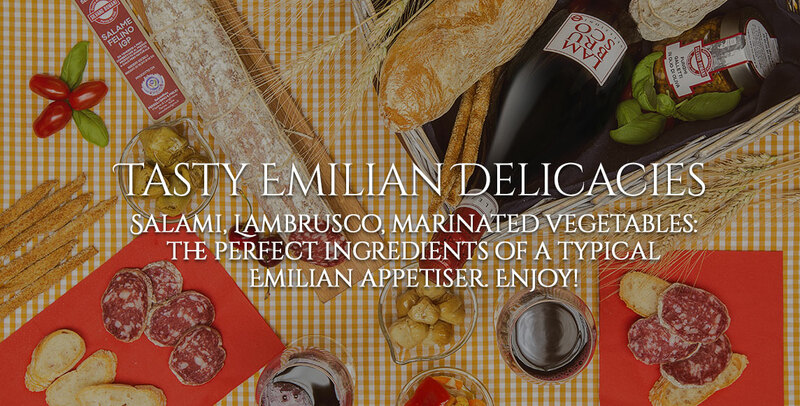 This red wine is excellent with all products of Emilian cuisine, rich of savour and intense scents. For an happy hour or a tasty snack Lambrusco perfectly fits with Parma Ham, Salame di Felino, Coppa di Parma o Culatello di Zibello. 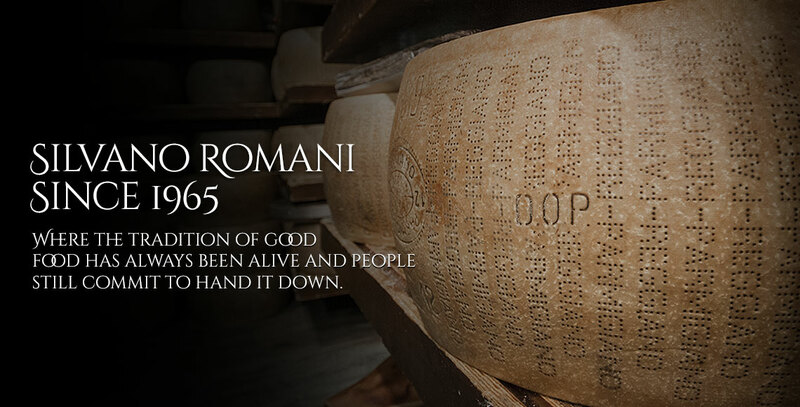 Also you can add some flakes of Parmigiano Reggiano. Furthermore Lambrusco fits well with first Emilian courses such as lasagne or anolini, but achieves its peak in combination with meat of pork, sausages and boiled meats. Because of its wide variety, there are different types of Lambrusco, which is better to combine with specific dishes: for example Gasparossa is suitable for dishes of meat, aged cheeses and pasta thanks to its natural strength of tannicity, while Sorbara is perfect for dishes of fish, salumi or fresh cheeses. 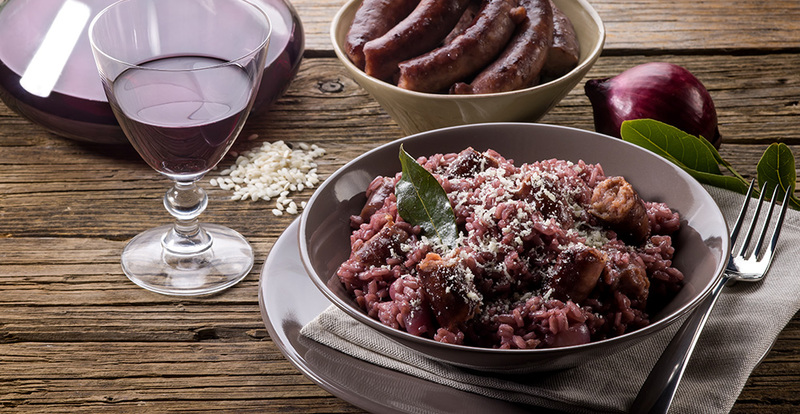 Moreover Lambrusco is used in the preparation of dishes, from risotto to meat and sweets. This risotto is a simple and tasty recipe. It is possible to add radicchio for a savoury variation. You have to take off the skin of the sausage and crumble with a fork. In the meantime you have to separately prepare the broth. In a pot you have to put butter, join minced onion and slightly fry. As soon as onion becomes transparent, you have to join the sausage and brown it for approximately 5 minutes. When sausage is vivid, you have to add rice, turn up the flame and mix for a couple of minutes. Then you have to join 2 glasses of red wine and evaporate them. When wine will evaporate, you have to start adding, little by little, the boiling broth until the rice is cooked. After you have to join grated cheese mixing and leave it to stand for a couple of minutes and serve it with a pinch of black pepper. Beef braised in red wine is a rich of flavour and easy to cook second course. This dish has to be slightly cooked for at least 2 hours and the dish is ready. You have to take a pan with high edges and make a slightly fried with oil, salt, garlic, carrots, onions and celery after having cut them to pieces. Then you have to cook vegetables in a slight manner, add meat and leave them to brown. Later you have to cover meat with red wine and slightly cook it for two hours, mixing now and then. You have to take the beef meat and brown it for approximately 12 hours with minced onion, carrot, celery and combine all with herbs and spices and abundant red wine. The following day you have to dry the meat, brown it with a little bit of oil and add the marinating of previous day. After approximately 2 hours and half of cooking, take off the meat from pan and slice it. Then you have to serve it with a sauce obtained by the whipped and reheated marinating. In order to prepare this dish it is necessary to brown chicken and bacon in a slightly fried of extra virgin olive oil, onion, garlic, rosemary and sage. Then you have to add abundant red wine and cook it in a slight manner for approximately 25 minutes. When the cooking is finished, you can prepare the dishes pouring on the chicken the red wine. Here there’s a very tasty and easy to prepare recipe for the lovers of meat. You have to salt and pepper both sides of beef filets. Then you have to warm up a pan with two spoons of oil and sear the meat 4 minutes for every side. Then you have to take meat off the flame and in the same pan leave to wither the shallot, after having cut it, add wine and balsamic vinegar and leave it to reduce all in order to obtain a solid sauce. After you have to put again the filet in the pan with sauce before serving it so that meat can flavour. You have to cut carrots and onions into big slices. In a bowl you have to join meat, which was cut into pieces, to vegetables and sprinkle with red wine and leave it to marinate for a couple of hours. Then you have to take meat off marinating, so roast the meat in pot with some oil, add the marinating in pot and leave it to boil. After you have to cook all in a slight manner for approximately 90 minutes and when it is ready, you can drain the sauce from stew and whip up in order to obtain a creamed sauce. Moreover it can be served together to the sauce and you may accompany it with polenta. How you can prepare a savour saurce for your vegetables, meat and fish. You have to take the butter off the refrigerator and leave it to soften at an ambient temperature. In the meantime you can clean and cut the onion in a thin manner and sift the flour. Then you have to put 30 grammes of butter in a pan with onion and make it melt slightly. Occasionally you have to mix butter in the pan in order to avoid attachment and burning. After some minutes you can add red wine, thyme, bay and salt and take up the flame in order to evaporate the alcohol of red wine and leave it to boil on high. Then you can enjoy 20 grammes of butter to the flour and add in the pan the vegetable broth or meat broth and also butter and flour that you combined. You leave to boil the sauce until it is reduced up to approximately 2/3 respect to the initial quality. Once you obtained a solid and creamy mixture, you have to switch off the fire and filter the sauce with a small strainer in order to remove possible lumps. A tasty chocolate cake that you should try! You have to put in a small pot cocoa, butter, sugar, wine and one pinch of salt and then leave it to cook in a slightly manner until to obtain a cream. Then you have put aside 150 grammes of the cream that you obtained and pour what remains in a wide bowl. After you have to add the eggs once each, whipping the eggs in order to leave to absorb every egg before putting the following, then join flour, chocolate (that before you chopped) and baking powder. You can work up to obtain an uniform mixture. Then you have to pour the mixture in a baking tray that is greased and covered with flour, bake the cake with red wine in the oven already hot at 160 °C and cook it for approximately 30 minutes. After you have to take it out of the oven and leave it to cool. Once that the sweet is cooled, do some cuts on the surface of the cake and pour the frosting. Stewed pears with red wine are a delicate sweet with a spicy flavour and they remember those, which the grandmothers prepared in the coolest periods. You have to boil red wine with sugar and water in a pot, then add star anise, cloves and pressed cardamom. Some minutes later you have to immerse clean and peeled pears, to boil them for approximately 10-15 minutes. When the cooking is finished, you have to filter the liquid and reduce it in a small pot, and then you can serve the liquid on stew pears. The donut with red wine is an ancient recipe that is handed down from generation to generation. You have to blend Lambrusco, sugar, olive oil, the spoon of Sambuca, the teaspoon of bicarbonate and a pinch of salt in a container. Later little by little you have to add 500 grammes of flour up to achieve a smooth and uniform mixture; moreover you have to leave to stand the mixture for an hour, then model with your hands the donuts and sprinkle the sugar. At the end you have to cover a baking tray with parchment paper and cook at 180° for approximately 20 minutes.